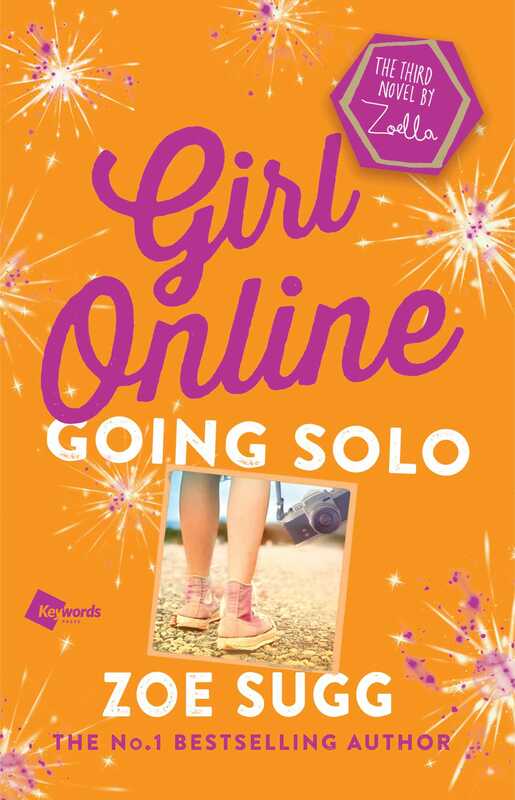 Award-winning YouTuber and blogger Zoe “Zoella” Sugg presents the third novel in her New York Times bestselling Girl Online series. Every time I walk around a corner there’s another reminder of him. Even though I’m sure he must be far away from where I am, I keep thinking I see him in a crowd of people just ahead of me....Am I going crazy? You know that saying that goosebumps happen when someone walks over your grave? That’s the same feeling I get—shivery, cold, a little bit scared—and it always makes me feel a bit pathetic. What can I do to drive the ghosts away and feel normal again? Penny’s life is back to normal. As she starts the school year, she’s ready to face the world—alone. Noah has gone off the radar after ending his world tour early, and no one, including Penny, knows where he is or why he’s left everything behind. So when Penny accepts Megan’s invitation to visit her performing arts school, it seems like an opportunity to make some new friends. Helping everyone else might be the right remedy—Elliot needs her friendship more than ever, as does her new friend Posey, who she can really help deal with her stage fright. And when charming Scottish photographer Callum comes along, Penny has more than her fair share of distractions. But is he the right kind of distraction? Can Penny truly move on when Noah’s shadow seems to haunt her around every corner? His eyes scan the screen and I worry at a hangnail on the edge of my pinkie finger. “Looks fine to me,” he says after a few agonizing seconds. His confirmation granted, I grab the laptop back and hit publish before I can change my mind. Immediately I feel a burden lift off my shoulders. It’s done now. I can’t take the words back. My “statement” is officially out there, even though it’s ridiculous that I even need to make a statement. Heat rises in my cheeks as I realize how angry this situation is making me . . . I shrug again. It’s about the only gesture I can muster. If I think about it too hard, all the emotions I’ve been struggling to hide will come bubbling to the surface. I don’t know what Noah’s definition of “soon” is, but it’s been well over a month now and I haven’t heard a peep. I have sent numerous texts, DMs, and emails, all with no response. I also didn’t want to seem like some desperate ex-girlfriend trying to track him down, so that slowed to a stop recently, but it still sends a gut-wrenching flicker through my mind every time I think about the fact he hasn’t responded. “Exactly.” I shuffle down to the end of the bed and grab a hairbrush off my desk. My eyes wander around the selfies pinned to the mirror as I run the brush through the knot of newly sun-kissed, auburn tangles; there are pictures of me with Leah Brown, Elliot, and Alex, even one with Megan. Most of them are obscured, though, by cut-outs of my favourite photographs from magazines—inspiration for my portfolio—and my A-level revision schedule, carefully highlighted and colour-coded so I know exactly what I need to do. Mum made a joke that I spend more time colour-coding than actually studying, but it helps me to feel in control of something. Everything else in my life seems just beyond my reach—Noah, my photography career, even my friends . . . Everyone is preparing for life beyond sixth form. Even though I’ve got a huge head start with my internship with François-Pierre Nouveau—one of the hottest photographers on earth—I feel like I’m standing still while everyone is running around me. Where do I go from here? “Do you think he’s found someone else?” Elliot peers at me over the rim of his glasses with an expression I know all too well: the “this is never going to go down well with Penny” expression that he likes to surprise me with every now and then. “Elliot!” I throw the brush at him, which he ducks easily. It hits the back wall and lands on a pile of laundry. “What? He’s single; you’re single. It’s time for you to get out there, Pen. There’s more to life than just Brooklyn.” He gives me one of his exaggerated winks and I roll my eyes. If there’s anything that makes me feel more agitated than Noah’s silence, it’s the thought of Noah with someone else. He smiles, but it doesn’t quite reach his eyes. I lean over and grab his hand. “Your parents will come around . . .” For weeks now, it’s been non-stop fighting in the Wentworth household. Sometimes we can hear them shouting through the thin walls of my attic bedroom; those nights are a little awkward. “Penny!” My mum’s voice echoes up the stairs to my bedroom. I turn my phone over and check the time. “Oh nuts. Come on, Elliot—we’re going to be late! I can’t miss my first lesson.” I scramble off the bed and start throwing books into my bag. I quickly check my face in the mirror, and it’s only then that I realize I only brushed one side of my head before throwing the brush at Elliot. I grab a hairband from my desk and gather my hair—tangles and all—up into a rough topknot. It will have to do. We take the stairs two by two, laughing and bumping into each other as we go. “I’ll think about it” was his response, but he’s never actually gone through with it. I suspect the thought of having a blog is more appealing to Elliot than the thought of all the work that goes into it. He’s always rolling his eyes at me when he sees me on my laptop yet again, but he also knows that’s what it takes to maintain it. And, since my long period of absence from it last year, I’m more determined than ever to make it a success. Outside, there’s a chill in the air that reminds me autumn is on the way, even though it’s still only September. This time of year is my absolute favourite; the leaves start to turn golden and wither away after their summer of hard work, and the sun seems to shine a lot more clearly as the mist from the summer heat disappears. Everything just seems a little brighter and fresher—a clean slate for the new school year. A clean slate. That’s exactly what I need. I think back to my favourite photograph of Elliot: he was wearing his normal clothes (skinny jeans, a burgundy T-shirt with a chunky-knit cardigan on top) along with a pirate hat with a huge feather sticking out, and he was balancing on one leg on an upside-down bucket we’d found on the rocky beach. He looked like a pirate king of Brighton. Albeit one with really good fashion sense. “Back to your mum’s wardrobe it is!” Elliot says with a dramatic sigh. I laugh. It’s true: Mum does have a ton of weird and wonderful accessories from her drama days. It’s only a short walk to school from the bus stop, but I miss Elliot’s company as soon as he’s gone. His absence gives me an ache like I’m missing an arm or a leg. I’m missing an Elliot—and it hurts. I don’t know what I’m going to do if he and Alex end up moving to London next year. The thought makes the chocolate croissant repeat on me, and I swallow to keep it down. My phone buzzes, and I immediately forget my promise and think that it might be Noah. But it’s not him. It’s Kira. “Where are you?” the text reads. Then I look at the time. I only have five minutes until my first lesson—and I’m supposed to be doing a presentation in history class with Kira. Oops. I pick up my pace into a run, race up the steps and through the double doors of my school. Just inside, two new Year Seven girls are bent over their phones, giggling at something on Celeb Watch. Immediately I feel my anxiety rising like a tide in my mind, in case it’s me they’re gossiping about—but this time it isn’t. It turns out that Hayden of The Sketch has broken up with his girlfriend, Kendra. When one of the girls looks up at me, she frowns—but there’s not a hint of recognition in her eyes. It’s just because I look a bit like a weirdo staring at them. I hurry past, my heart beating quickly inside my chest. I don’t even turn any heads anymore. I breathe a sigh of relief, letting the anxiety wash away. Noah and I are officially yesterday’s news. I’m just a normal girl, living a normal life in a normal school. It’s what I’ve wanted ever since the end of the tour. “Penny! GOODNESS ME, there you are.” Kira comes running up to me, snapping my train of thought before it can get too long. She launches into a run-through of our presentation, so I let her pull me through the school hallways and back into normality. Zoe Sugg, aka Zoella, has been creating stories ever since she was little. Her beauty, fashion, and lifestyle blogs and videos have a huge following online, with millions of YouTube subscribers. Visit Zoella.co.uk, YouTube.com/Zoella, @Zoella on Twitter and Instagram, and GirlOnlineUS.com.